INCIDENT #1: At about 10:25 AM on Wednesday, November 1, 2017, officers assigned to District C-11 (Dorchester) responded to a call for a found weapon in the area of 30 Homes Avenue in Dorchester. On arrival, the officers were directed to an apartment where they safely recovered a loaded AK-47 assault rifle. The firearm was loacted by a person who was working inside the residence at the time. The apartment is currently unoccupied and was being cleaned and prepared for new tenants at the time of the discovery. The firearm has since been turned over to the Boston Police Firearms Analysis Unit for processing. INCIDENT #2: At about 11:15 AM on Wednesday, November 1, 2017, officers assigned to District B-2 (Roxbury) made an onsite firearm arrest after recovering a loaded firearm during a traffic stop in the area of 2363 Washington Street in Roxbury. The officers were on directed patrol in the area of the Dudley Triangle due to recent incidents involving firearm related violence when they stopped a motor vehicle for a traffic infraction and discovered that the operator, Osagie Mastin, 22, of Roxbury, did not possess a valid driver’s license. After the officers removed the operator, they located a loaded firearm inside the vehicle. When the officers attempted to place the suspect in custody, he immediately fled on foot but was quickly appended and placed in custody without further incident. The suspect will appear in Roxbury District Court on numerous charges including Unlawful Possession of a Firearm, Unlawful Possession of Ammunition and Carrying a Loaded Firearm. INCIDENT #3: At about 1:07 PM on Wednesday, November 1, 2017, officers assigned to District A-7 (East Boston) responded to a radio call for a robbery in progress in the area of 142 Gove Street in East Boston. A responding officer performing a search of the area located a person matching the suspect description and approached to speak with him. When the officer attempted to perform a pat frisk, the suspect pushed the officer away and a violent struggle ensued. While restraining the suspect, the officer called for additional units who quickly arrived on scene and placed the suspect in custody. The officers then recovered a loaded .380 caliber Bersa handgun from the waistband area of the suspect's pants. The suspect, Juan Martinez, 21, of East Boston, will appear in East Boston District Court on charges of Unlawful Possession of a Firearm, Unlawful Possession of Ammunition, Assault and Battery on a Police Officer and Resisting Arrest. INCIDENT #4: At about 10:25 PM on Wednesday, November 1, 2017, officers assigned to the Youth Violence Strike Force made an onsite firearm arrest of a juvenile in the area of 42 Horan Way in Jamaica Plain. 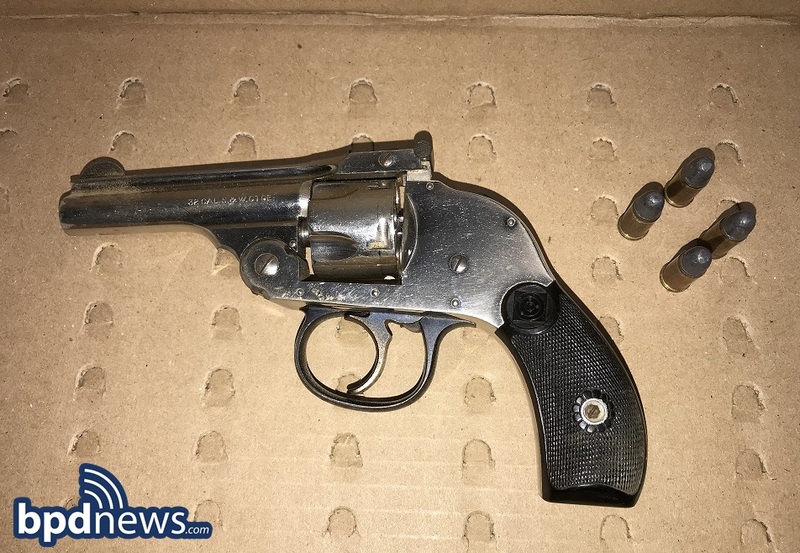 The officers were on directed patrol in the area of the Heath Street Housing Development due to recent firearm related violence when they arrested a 16-year-old male from Brockton, on firearm related charges. During the investigation, officers located and recovered a loaded .32 caliber Smith & Wesson Model CTGE32 revolver and a loaded .22 caliber (LR) Phoenix Arms Model HP22 handgun (See Images Above). The juvenile suspect will appear in West Roxbury District Court on charges of Delinquent to Wit: Unlawful Possession of a Firearm (2 Counts), Unlawful Possession of Ammunition (2 Counts) and Carrying a Loaded Firearm (2 Counts).